Anyone who knows me remotely well enough knows that I am in love with Seventeen Magazine. I have been subscribed to it since I was roughly 13-years-old… maybe even sooner! I’m getting too old, I can’t remember. One reason I’ve always loved Seventeen was because of their vow to stay true. They provide girls with real advice, real options, real stories. They empower young girls to be true to who they are and not be afraid to take risks. And today, news has been surfacing that they’re going one step further in that real girl empowerment. I saw this image posted on HelloGiggles yesterday and could not have been more excited! This is in their August issue (currently sitting on my night stand, featuring the fab. Shay Mitchell on the cover, actress in ABC Family’s Pretty Little Liars.) Seventeen has always promoted embracing yourself, regardless of your body type. 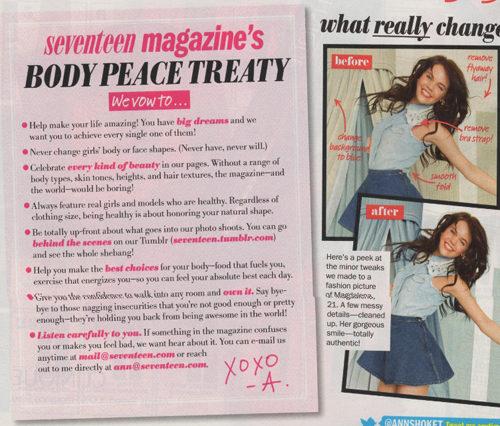 In every issue, their Body Peace Treaty is mentioned, as well as work outs and ways to stay healthy without the emphasis on being stick-thin. Now, they’ve gone a step further thanks to one 14-year-old reader who wanted to make a bigger change.